Ana Maria Maiolino’s second solo show in the gallery precedes, by a few months, a major retrospective that is being prepared for PAC – Padiglione d’Arte Contemporanea, in Milan. Entitled Love is made revolutionary [March 28 to June 9], this is the artist’s biggest exhibition in her native country and after Pac Milan, it goes to the Galleria d’Arte Moderna di Palermo, in Sicily [July to September], and to the Whitechapel Gallery, in London [October 2019 to January 2020]. Celebrating the artist’s 60 years trajectory – with more than 50 solos exhibitions besides participation in more than 300 group shows; Love is made revolutionary involves all the medias which Maiolino works with: drawing, sculpture, video, performance, sound art, installation, photography and etching, and in the exhibition in Milan she will show a never before seen performance. Before travelling to Italy, Mailolino materializes EM TUDO – TODO [In everything – all]. The solo show in Luisa Strina Gallery is composed of 19 pieces and its main subject is the line, with their forming points in the sculptures as well as in the drawings in exhibition. 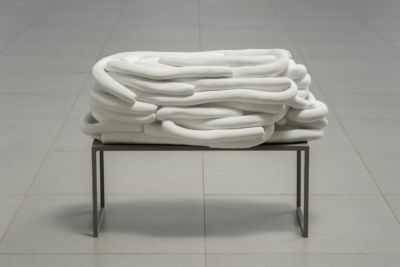 They are 4 pieces in the series Cobrinhas (Little Snakes), concluded in 2018, which are sculpture works that the artist has been developing for almost 30 years using the same methods and techniques, when the repeated gesture to make rolls (line) sets up the sculptures, having a finishing of white cement and marble dust. Completing the show, there are 15 works on paper that belong to the series Conta-gota (Eye dropper, 2016); Pulsões & Traços (Drive & Traces, 2015); Meandros (Windings, 2014); Projetos de Escarificações (Scarification Projects, 2012); and Vestígios (Vestiges, 2012). “About dots and lines, Kandinsky has already spoken beautifully, all it is needed is to recall his thoughts as: ‘Everything begins in a dot, and the line is born’. It is what grants materiality to the rolls or little snakes, and it is what composes the drawings graphic experiences – and for the drawing of all times, but which is renewed in the poetic here shown”, the artist explains. Maiolino has already spoken, in different occasions, about the importance of the line in her work. In a conference in New York in 2010, the artist made this clear: “I start with a drawn line. As drawing is the first tool to be used, that I use as a bridge to manage my mind from the immaterial to the tangible and it makes me say: ‘I draw therefore I am’. Whomever draws, they draw their own wishes, aligned with the living experiences”. In the course of this “imaginary seeing”, and using her own experience as an artist, Maiolino states that drawing is the product of a mind’s acts in relation to the basic actions of human living. “These ancestral functions and actions make drawing ONE with the language construction possibilities – substrate from our genetic code”. As we build language and materialize feelings, we give and take in a symbiotic relation of exchanges. In this sense, perception – a conscience originated activity – hatches and manifests meaning with the object. (…) Surrealists used to say that drawing is the ECHO of our drive and dreams. To me, it is really that, but also the building of materiality, because the materialized line can occupy multiple dimension in the real space”. In 2017, a major retrospective on Maiolino’s work was presented at the MoCA Los Angeles, as part of the Pacific Standard Time: LA/LA project, sponsored by the Getty Foundation. In 2010, an important itinerant show was presented at the Antoni Tàpies Foundation, in Barcelona, travelling then to Centro Galego de Arte Contemporânea (Galician Contemporary Art Center), in Santiago de Compostela, Spain, and to Malmö Kunsthalle, in Sweden (2011). Maiolino’s work is present in over 30 museum and cultural institutions collections in Brazil and abroad, among them, notably: MoMA, MoCA Los Angeles, MASP, Malba, Reina Sofia, Centre Pompidou, Tate Modern and Galleria Nazionale di Roma. Among her major solo exhibitions from the decade of 2000 there are: Errância Poética [Poetic Wanderings], Hauser & Wirth, New York (2018); TUDO ISSO [ALL OF IT], Hauser & Wirth, Zurich (2016); CIOÈ and performance in ATTO, Galleria Raffaella Cortese, Milan (2015); Ponto a Ponto [Point to Point], Galeria Luisa Strina, São Paulo (2014); Afecções [Affections], Visual Art Prize MASP Mercedes–Benz, MASP, São Paulo (2012); Continuum, Camden Arts Centre, London (2010); Territories of Immanence, Miami Art Center, Miami (2006); Muitos [Many], Pinacoteca do Estado de São Paulo (São Paulo State Public collection, 2005); Vida Afora/A Life Line, The Drawing Center, New York (2002); and N Times One (from the series Terra Modelada [Modelled Earth]), Art in General, New York (2002). Among the group shows she has participated in recent years, remarkably: Mulheres Radicais [Radical Women], Pinacoteca do Estado de São Paulo (São Paulo State Public collection, 2018); Radical Women: Latin American Art, 1960–1985, Hammer Museum, Los Angeles (2017); Delirious: Art at the Limits of Reason, 1950-1980, MET Breuer, Nova York (2017); Lugares do Delírio [Places of delirium], MAR – Museu de Arte do Rio (Rio Art Museum, 2017); Resistence Performed – Aesthetic Strategies under Repressive Regimes in Latin America, Migros Museum, Zurich (2015); The EY Exhibition: The World Goes Pop, Tate Modern, London (2015); International Pop, Walker Art Center, Minneapolis (2015); The Great Mother, Palazzo Reale, Milan (2015); Impulse, Reason, Sense, Conflict, CIFO Art Space, Miami (2015); Artevida, MAM Rio de Janeiro (Rio de Janeiro Modern Art Museum) and Casa França-Brasil (France-Brazil House), Rio de Janeiro (2014); dOCUMENTA 13, Kassel (2012); On Line: Drawing Through the 20th Century, MoMA, New York (2010); 29ª Bienal de São Paulo (2010).